Every High Street starts and ends on a corner! So take a look at the buildings that can lead you into a stroll along your personal street. Upton upon Severn, a small town with an extremely pretty high street! Over it’s long history, this building has housed a number of different businesses, but here we present it as a chandlery. Upton upon Severn has a busy marina, and tourists visiting the area often choose to enjoy a boat trip along the river! Here we see the shop windows filled with canoes, kayaks, lifejackets, and all the things you would need for a boating break. Upton is also home to more than one annual international festival, and as the sign beside the first floor window shows, this little shop also sells festival tickets! 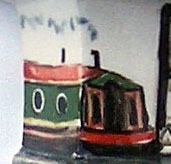 The Chandlery by the river is a Limted Painting of 200 ceramics. 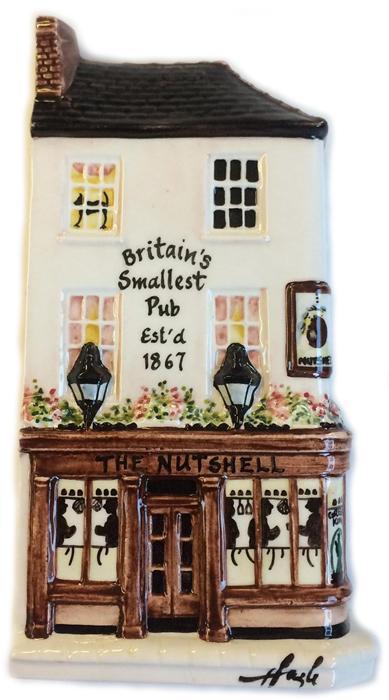 Situated on a corner in the historic town of Bury St Edmonds, Suffolk, The Nutshell is recognised at England’s smallest pub, according to the Guinness Bookof Records. It measures just 15ft x 7ft, and as 12 customers make it a squeeze, we’ve painted just seven regulars enjoying a tipple inside!On display inside are suitable curiosities, such as the smallest ‘Times’ newspaper, and the smallest dart board. Notice the black cat in the top left window. Inside the pub is suspended a mummified black cat, discovered during building work. Builders used to brick cats up behind chimney hearths, which was thought to bring good luck into the building – not so good for the cat obviously! If you visit, ask the landlord for a “Baloga Taxi” – he will be very surprised. First produced by Hazle Ceramics in 2008, The Nutshell measures 19cm(7 &1/2″) tall to top of chimney x 9.5cm (3 & 3/4″) wide at the widest point, and is available in a choice of 2 colourways, brown or blue. 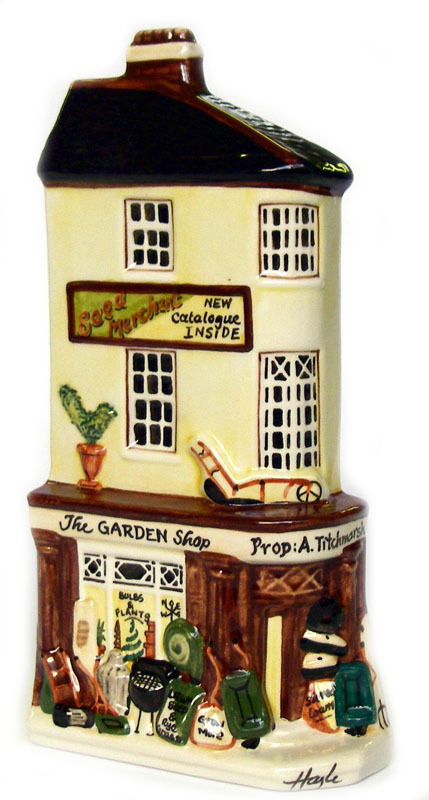 Our Garden Shop is based on a long established ironmongers in Uppingham, Rutland. This business still survives today, and provides an interesting alternative to the DIY superstore garden centres. 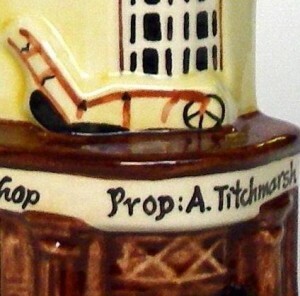 Based on D. Norton & Son Ironmongers in the Market Place, Uppingham. Home of a respected public school, it’s a very attractive small town and well worth a visit – antiques, cream teas, second hand books, outdoor pursuits gear … all made available in delightful unspoilt independent shops. 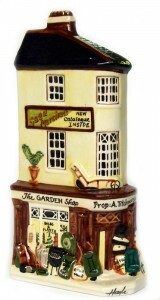 The Garden Shop measures 21cm (8 & 1/4″) tall to top of chimneyx 10.2cm(4″) wide at widest point. 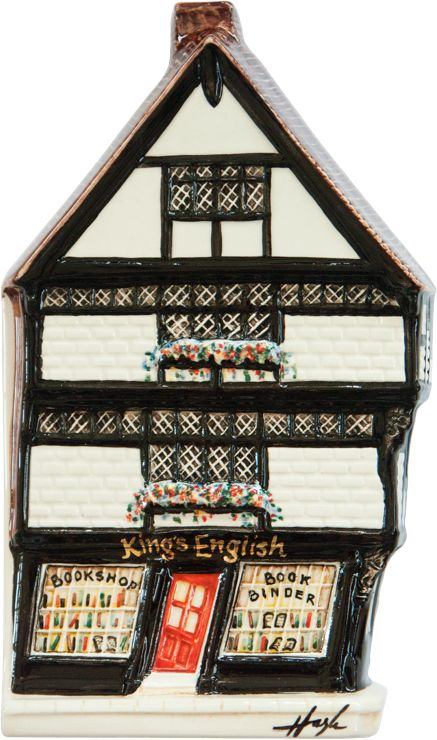 This historic building constructed in 1647 and located in the heart of Canterbury, was once the School Shop for the Kings School, Canterbury. It has leaned to the right since the 1800′s and it was not until 1980 that the building was stabilished. If you vist Canterbury, do try to get inside – the floors and stairs match the leaning exterior perfectly, making walking from one side of the upper floor to the other a very unique experience! Here we show it not as a School Uniform Suppliers, but as a book shop! In it’s long history this building has been home to many businesses, including a book seller. Whatever our individual politics, who could recognise this unique, strong, clever and brave woman who fought her way to the top of world politics in an age when women were simply not accepted in this ‘men’s world’. She epitomised the heart of ‘Middle England’, a grocer’s daughter, and grammer school girl who was proud of her origins and maintained the principles she learnt as a child all her life. 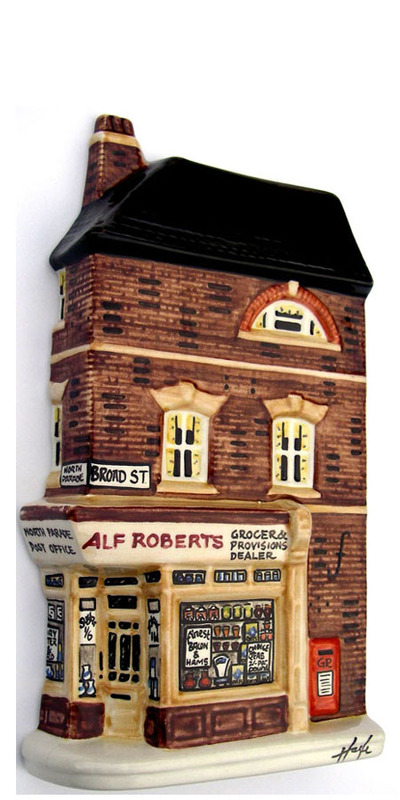 Our ceramics are hand painted with care, individual artisits work can vary, and a photo of one ceramic will not depict exactly every ceramic painted. 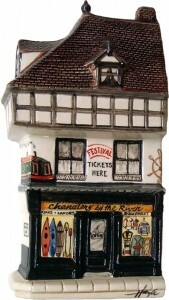 Our ceramics are hand made and individually finished. This means the measurements can very slightly from one to another, but only by a milimetre or two.